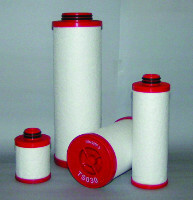 Filter capable to separate particles down to 1 micron, liquid an oil included. Maximum contents of residual oil 0,1 mg/m³. Normally used on outlet of dryers as 0,01 micron grade pre-filter. 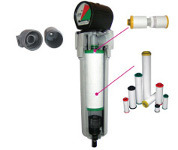 The item is supplied with aluminum body, filter cartridge, manual drain valve and packaged in single carton box. The differential gauge is optional. Item N Lt/min N m³ / h Connections Dimensions mm. Weight Kg.